Early sailors in New York Harbor used a large elm tree as a landmark while navigating off Staten Island, and when an official aid to navigation was placed at this point on Staten Island, it was appropriately named Elm Tree Lighthouse for the tree whose purpose the tower had supplanted. 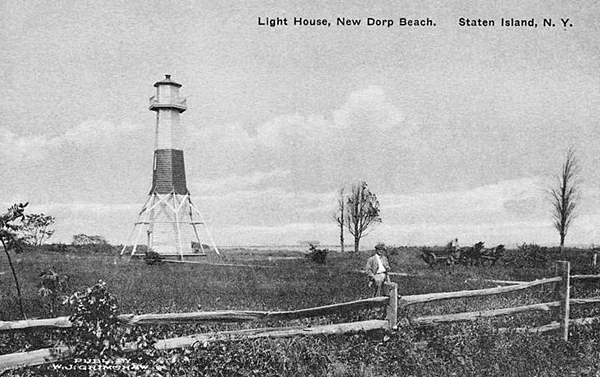 The beacon was situated on the south side of the island, near the shoreline, and functioned as a front range light, operating in conjunction with New Dorp Lighthouse located on a hill, one-and-a-half miles inland. Of these ranges there are three: one to guide vessels through the Swash channel [Elm Tree/New Dorp], another through Gedney’s channel to Southwest spit [Point Comfort/Waackaack], and the third to guide vessels to and from the Narrows [Conover/Chapel Hill], requiring the construction of six light-houses, with three separate keepers’ dwellings, four of which are located in New Jersey and the other two on Staten Island. In accordance with the plans furnished for these by the Light-house Board in April last, a contract, dated June 11, 1855, was entered into with Richard Calrow, jr., of the city of New York, for the construction of these six range light beacons at the stipulated price of $19,124 for the whole, which included the construction of nine separate buildings in all, viz: Three hexagonal towers, three keepers’ dwellings, with light-turret in the centre, and three separate keepers’ dwellings, all of wood, upon foundations of brick laid in cement. The work to be completed on the 25th October, 1855. 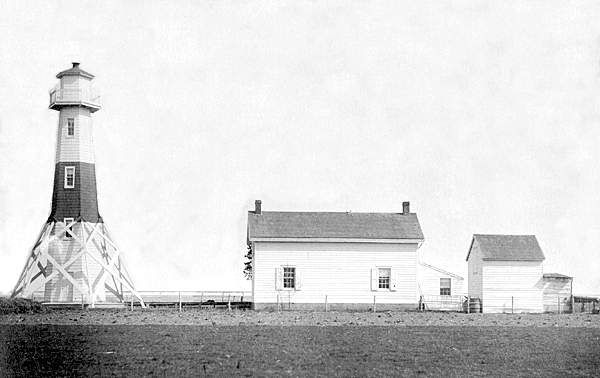 Elm Tree Lighthouse, a hexagonal wooden tower that stood roughly fifty-five feet tall, began operating in 1855, showing a fixed white light from a third-order range lens at a height of sixty-two feet above sea level. The light’s first keeper was William Hooper, who lived in the station’s five-room, one-and-a-half-story dwelling. Originally, the dwelling and tower, which featured a central red band, were positioned right next to each other, but a change in the course of Swash Channel required that the tower be moved 250 feet to the northeast in 1891. The basement beneath the tower at its original location was then converted into a cellar for the keeper. Jacob C. Swaim was born in New Dorp on Staten Island and first worked in the oyster planting business before taking a job with the New York City Police Department in 1857. After nine years with the police department, he worked for the Quarantine Department of the Port of New York for seven years, and then entered the Lighthouse Service, working at the depot at Tompkinsville. Jacob Swaim’s first wife, Ann Winant, passed away in 1875 after having given birth to seven children, and the following year Jacob was appointed keeper of Elm Tree Lighthouse, a position he held for thirty years. On February 14, 1906, Keeper Swaim died, leaving behind his children and a nearly penniless wife. It was a general custom when a male lighthouse keeper died to appoint his widow as the new keeper if possible, and Sara applied for her husband’s post. The position, however, was instead awarded to Edward Burdge, who had been keeper at West Bank Lighthouse for about six years. Jacob Swaim had been a popular man in the local community, and a petition was raised to force the Lighthouse Service to reconsider its decision. Captain R. McKenzie, the Lighthouse Service Inspector for the area, said he understood the popular sentiment, but wrote, “As a business proposition the Light House Establishment must pay more attention to living keepers than to the relatives of dead ones.” The seemingly hard-hearted inspector added that Sara had “married Mr. Swain some seven or eight years ago when he was about seventy years old and cannot herself be said to have any great claim on the Light House Establishment.” Edward Burdge began his service as keeper at Elm Tree Lighthouse on April 14, 1906. Burdge was, at the time, a twenty-year veteran of the Lighthouse Service, having previously served at Navesink, Old Orchard Shoals, and West Bank. In a 1924 interview, Burdge told about a pet he had out at West Bank. Had a little dog once – fox terrier. Got him when he was a pup and I was over on Old Orchard Shoals. Took him with me out to West Bank when it was first built, and raised him out there. You couldn’t get that dog to live ashore. Sometimes when I took him with me after supplies, he’d run down to the edge of the water and look out toward the light, and whine. If the light dimmed at night, or the fog signals stopped, he’d bark and tear around. He recognized a lot of boats, too, and would bark to the tugs he knew. I used to tie a flag to his tail, and he’d run out onto the gallery and wave signals. He always slept outside on the gallery, no matter how stormy it was, and watched the light and the boats. He was a lot of company. When I was transferred to Elm Tree I brought him ashore with me, but he wouldn’t live here. He was homesick, so I had to take him out and give him to the new keeper on the West Bank. He lived on the offshore lights for eleven years. Then the keeper brought him ashore, and he died in three days. Take being a keeper of a lighthouse, for instance. It’s a sort of easy job – at least those who never kept a light say it is. There isn’t much to do most of the time. But when there is something to do, it counts. It teaches a man to rely on himself and to do things for himself. Maybe there isn’t a big, important thing to do more than once a year; but waiting three hundred and sixty-four days, twenty-three hours and fifty-nine minutes, so as to be sure to be on the job in that other minute is hard enough. But it isn’t a bad job; though, of course, on an offshore light one hasn’t any close neighbors. Fact is, if it weren’t for the flies I’d think it was a pretty good job… Worst place in the world for flies! They swarm by millions on lights miles off shore until the keepers pray for a gale of wind to sweep them away. A fellow has lots of time to think, and out there, alone on the water, with the ocean and the sky, the storms and calms, after a while a fellow quits thinking of himself as being important, or fitted to be something else. I never heard of a lighthouse keeper having the swelled head. 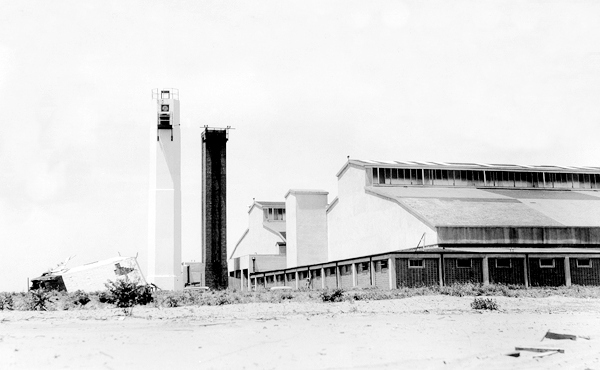 In November 1919, as World War I was winding down, Miller Airfield was built adjacent to Elm Tree Lighthouse on what had been the farm of William H. Vanderbilt. Named in honor of Captain James Ely Miller, who was shot down in Europe during the war, the airfield served first as an Air Service Coast Defense Station and later as an Army Air Field, a Coast Artillery gun site, a Nike Missile Repair Depot, and a U.S. Army Special Forces base. On December 16, 1960, a TWA Lockheed Super Constellation bound for LaGuardia and a United Airlines DC-8 headed to Idlewild Airport (now JFK), collided above Miller Field. The wreckage of the TWA plane plummeted to the ground at Miller Field, while the DC-8 eventually crashed in Brooklyn. The mid-air collision was the worst airline disaster in the United States at the time. All 134 persons on board the planes were killed along with six people at the crash site in Brooklyn. 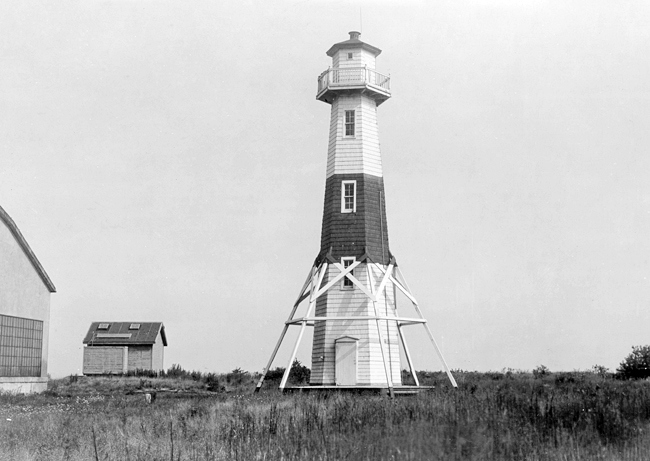 In 1939, the old wooden Elm Tree Lighthouse was torn down, and the beacon was moved to a sixty-five-foot-tall concrete tower. The new tower functioned as an aviation warning beacon as well as a maritime one. 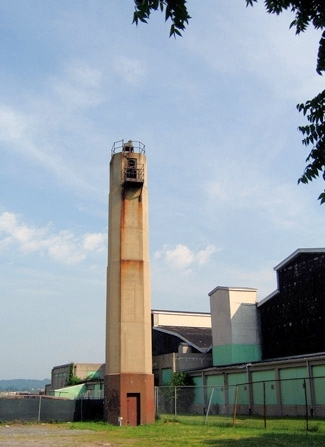 The City of New York Armory Board maintained this tower, which showed alternating white and green lights for aircraft, while maritime traffic could only see a fixed white light on the range. 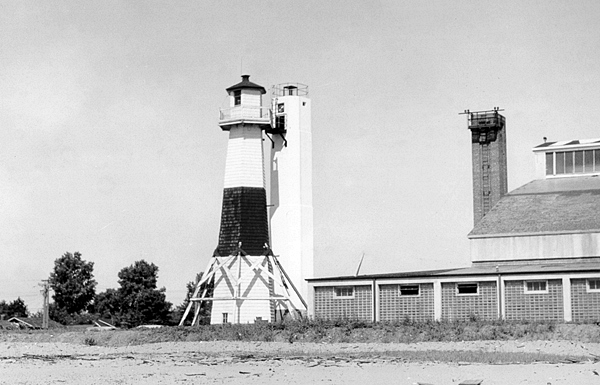 In 1964, both the Elm Tree and New Dorp range lights were discontinued and replaced with channel markers. Miller Field was abandoned in 1969, and the land was turned over to the National Park Service in 1972. The field, which is now home to several ball fields, is part of the Staten Island Unit of Gateway National Recreation Area. 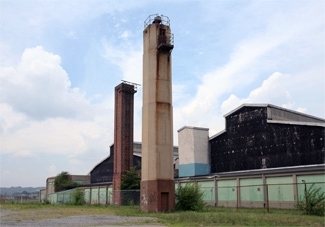 The concrete Elm Tree Lighthouse and a vacant double seaplane hangar remain standing as reminders of the events that formerly played out on the present sports fields. Head Keepers: William Hooper (1855 – 1859), Sarah Ann Hooper (1859 – 1867), John Wood (1867 – 1873), Thomas Burke (1873 – 1876), Jacob C. Swaim (1876 – 1906), Sara Ann Swaim (1906), Edward B. Burdge (1906 – at least 1921). “Could You Live Alone, Like Ed Burge Did Long Ago?,” Hugh S. Fullerton, Lighthouse Digest, January 2004. 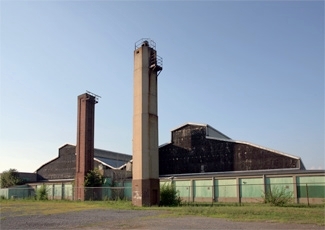 Located in Miller Field on the eastern shore of Staten Island. For a larger map of Elm Tree Lighthouse, click the lighthouse in the above map. 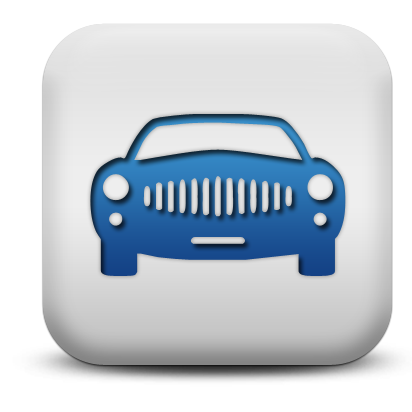 From I-278 on Staten Island, take Exit 12 and proceed south on Slosson Avenue. Slosson Avenue will shortly become Todt Hill Road. Follow this road for two miles until it intersects Richmond Road. Continue south on Richmond Road for 0.4 miles. Turn left on New Dorp Lane and drive roughly 1.5 miles to Miller Field, where you will find the light. The lighthouse is owned by the National Park Service and is part of Gateway National Recreation Area. Grounds open, tower closed.